This year, the event was planned with flexibility in mind to handle up up 244 people if necessary. The pre registration forms helped out immensely. Having a plan in place to go from round robin play to double elimination and if necessary, single elimination, worked very well. A new volunteer tournament director Jeremi Skillman and assistant director Sue Guyer both understood the challenges they could face. I spoke with them for a few moments, and took a few photos, before I left to go to the main park for the Corn Hole event, leaving with a good feeling that they would do a great job. 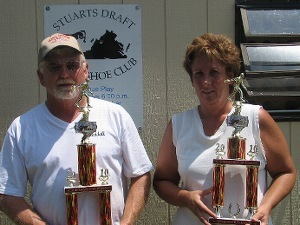 The Stuarts Draft Horseshoe Club, in connection with Augusta County Parks, hosted the 7th annual horseshoe tournament on Saturday August 24, 2010. The weather was forecast to be the biggest entry that day, with the temperature to reach the high 90’s and heat index to be around 105! The “Draft” lived up to its name with a breeze all day. We had 27 preregistered pitchers with more arriving that morning, ended up with 35 pitchers in all including Scott Shields coming all the way from PA. The first few rounds went very fast, giving the desk a challenge to keep up with them. With the double elimination format, it was a matter of running the games in sequence, but it also gave the players a chance to sit, cool off and hydrate. There were some great moments during the day and it was fun hearing everyone come to the desk laughing and having a good time. As everyone left, they all said they were looking forward to next year’s Sweet Dream Tournament. We had a great time, and are looking forward to it!